To share your own work with others using the ArcGIS Code Sharing site, click the UPLOAD SCRIPTS button, fill out a few fields, add some tags, and upload the file. 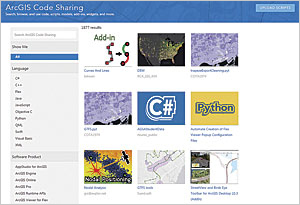 Because the ArcGIS Code Sharing site is part of ArcGIS Online, when you share things through it, those items will also appear and can be managed using the My Content tab of your ArcGIS Online account. When you share code and other items with everyone through your My Content tab, these items will automatically appear in and be searchable on the ArcGIS Code Sharing site. Don't forget, you can also locate and share code samples on GitHub as well as ArcGIS Code Sharing and ArcGIS Online.